This stationary sofa has exposed carved wood along the back, front and down the rolled arms. 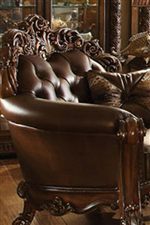 With deep tufting on the attached back, these elements come together to create a traditional style sofa perfect for the sitting or living room in your home. Three pillows are included to complete the look of this sofa. The Vendome Stationary Sofa with Tufting and Exposed Wood by Acme Furniture at Carolina Direct in the Greenville, Spartanburg, Anderson, Upstate, Simpsonville, Clemson, SC area. Product availability may vary. Contact us for the most current availability on this product.